My Beyond Copenhagen Series tries to write about attractions in Denmark beyond what's popular in central Copenhagen area. I've written about Hillerod Castle earlier. 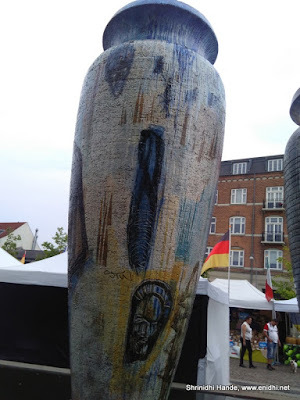 In this post, I am writing about the Roskilde Jars. Roskilde is a town some 30 kms (8 zones away, costing 96DKK onway train ticket unless you buy a 130DKK 24 hour all zone pass) from Copenhagen. 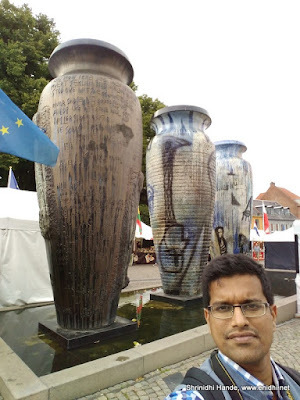 I went there on 15th August after attending Independence Day celebrations at the Indian Embassy. Roskilde has several attractions- a great Castle, few museums, a boating point, a garden etc. I will write about each of them in a separate post each. In this post, it will be Roskilde Jars. The Roskilde Jars (locally known as Roskilde Krukkerne) are a set of huge designer jars in the centre of Roskilde town. 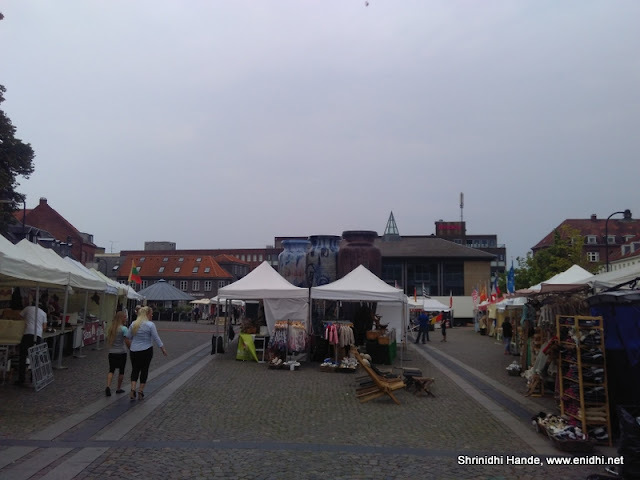 It is right opposite the Roskilde Railway station, but on the day I went, there was food exhibition in town and there were stalls all around the Jars. So I didn't notice it upfront. Only after roaming all around Roskilde while returning I stopped at these for a minute. The jars were designed by Danish architect/sculptor Peter Brandes and designed these jars on orders from the bosses of a local meat processing company. Today if nothing else, these jars stand in the middle of town as a tourist attraction and selfie point. Gigantic jars. Sure symbolizes life and death.